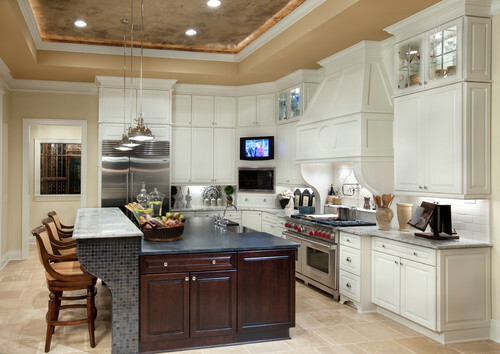 Have you ever gone into a home with a TV in the kitchen, and for some reason, it’s just right? 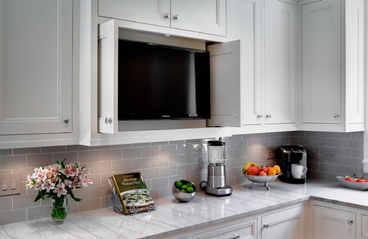 That didn’t happen by accident – here’s how you too can find the perfect TV for your kitchen. 1. Where’s it going to go? How much room do you have on the counter? On the wall? Under the cabinets? 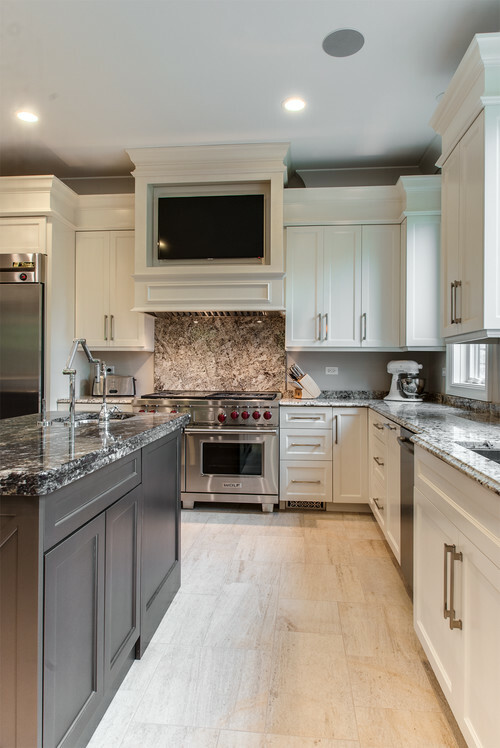 Many kitchen TV’s are either flip-down models, which you can mount under the cabinets, or stand-up units with a broad base to protect against knocks and bumps. If you have an open spot on the wall, that’s another great place for your screen. Before you buy, you can put a dummy in the place of the TV for a few days to make sure that the spot will work. Just cut out a piece of cardboard and stand or tape it in place. You might be surprised how what you thought was a low-traffic area actually sees a lot of action. Also, think about where you walk, and what you’re carrying when you walk there. 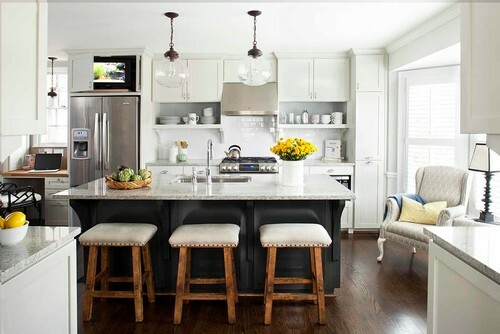 Lastly, be sure that the backs of your barstools don’t bump the TV or its counter when people push back to stand up. A word of caution – avoid placing the TV on top of the microwave. The picture will get fuzzy and grainy every time you microwave something. 2. What color is best? 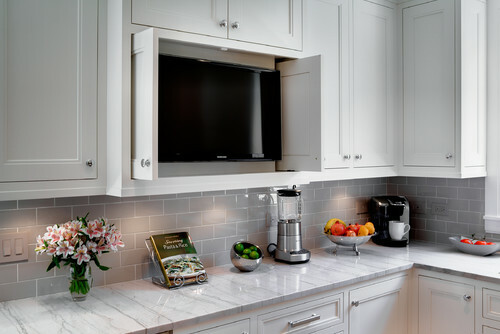 Most kitchen TVs are available in black, white or silver finish. It’s just a matter of coordinating with your décor. 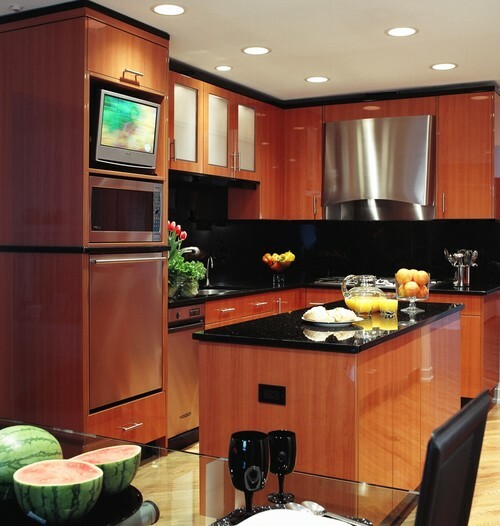 Some come in funky colors like bright pink, which can be a hit if you have a more colorful kitchen. 3. How much space do you have? Most kitchen TVs are 23” or smaller. Under-the-counter flip-down TVs are the smallest of the bunch, usually in the 15” range. But larger TVs can work well, too. Consider where you’ll be when you watch it. Standing only a few feet away? A small TV will be fine. 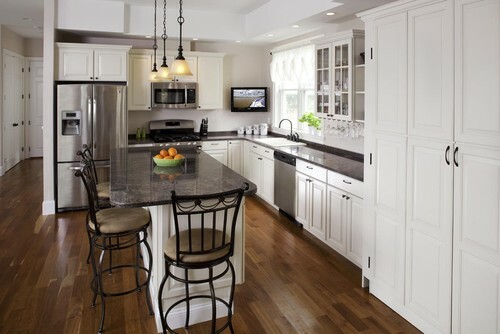 But if you usually dine in the kitchen on your comfy barstools, you might want a larger TV that’s mounted on the wall or standing on a shelf. Also think about if you’ll be watching from different areas – say, standing near the stove while cooking, then sitting at the island while eating. In this case, you might want a swivel base or arm that lets you point the screen wherever you’ll be. Some under-counter TVs swivel on their hanging mounts as well. 4. How will you hear the TV? Kitchen TVs are notorious for their poor sound quality – but let’s be fair, their tiny speakers have to compete with roaring fans, buzzing microwaves, rushing sinks and clanging pots. If you want to hear every word, make sure your kitchen TV has an audio output jack, then hook up aftermarket speakers or a sound bar. 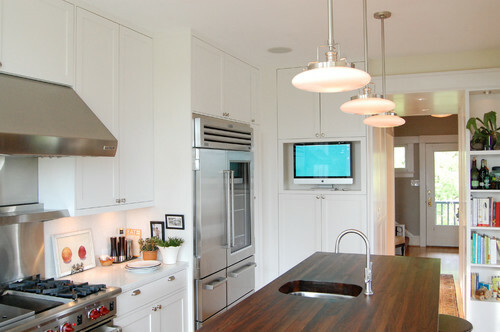 Do you have a TV in your kitchen? Visit our Facebook page and let us know what you like and what you’d change. Let us know if you have any questions, then think of us when you need comfy barstools to watch it from!